Today I'm sharing the machine that started the herd, a Necchi. This little girl came home with us from Goodwill one Saturday afternoon. My husband came up to me and asked "Is Knee-chee a good sewing machine?" It took at whole second for my brain to process what he said and I was running to grab it. I knew he meant neck-ee but he didn't know that's how you pronounced Necchi. When I saw the price tag I almost ran with it to the cash register before they came out to change it. $6.95 that was it. I've wasted 7 bucks on worse things and I had checked the hand wheel moved. There's been a few spats over who really bought it or who really found it. 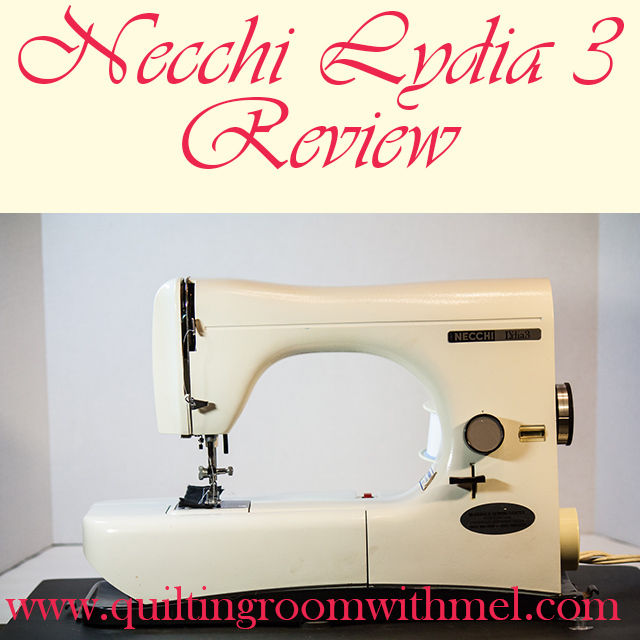 Hubby says he did since I didn't see it and I say I did because he was clueless until I gushed about Necchi sewing machines and how my mom had one. This post may contain affiliate links. &nbsp;Purchasing items from the links cost you nothing more and adds a few pennies to the fabric budget. So once we got the machine home we did a little looking at it. It had been serviced a few times by Necchi authorized dealers but I knew one of the places hadn't been in business for awhile. Then I got online to find more information about them. One of the first things I found was the machines have a bad habit of cracking it's camstack. That sometimes kills the machine and sometimes it just means that all it will do is straight stitch. So I followed the instructions to look at the cam stack and by golly the cam stack was whole. I do suspect that one of the services was replacing it because it looked awfully new to be original. Plastic from the 60s isn't bright white and this was white and only stained where the oil and grease had touched it. So a basic dusting of the machine and she was ready to go. It was almost like the woman or man who owned this cleaned it one day and donated it to Goodwill just a few weeks later. This machine is a little picky. She'll sew light weight fabrics and heavy fabrics but you better have the needle that the manual calls for or she'll go all wonky. She got mad enough at my husband that she knocked herself out of time. There is a service manual online in one of the many Necchi groups on Yahoo and Facebook. Since my husband is super mechanical he was sure he could do this. He had the tools, the knowledge, and the will to do it. Three weeks later and I was searching for a Necchi repairman. I was in talking to him while he was working and I was looking at the book when the problem jumped out at me. The text said .5 mm and the diagram said .05 mm. When he followed the measurements of the diagram it went right back into time and has sewn wonderfully ever since. Viewed as a Necchi oops - I disagree wholeheartedly but there are some out there who will look down their nose at this machine. Want more information on the Necchi Lydia? 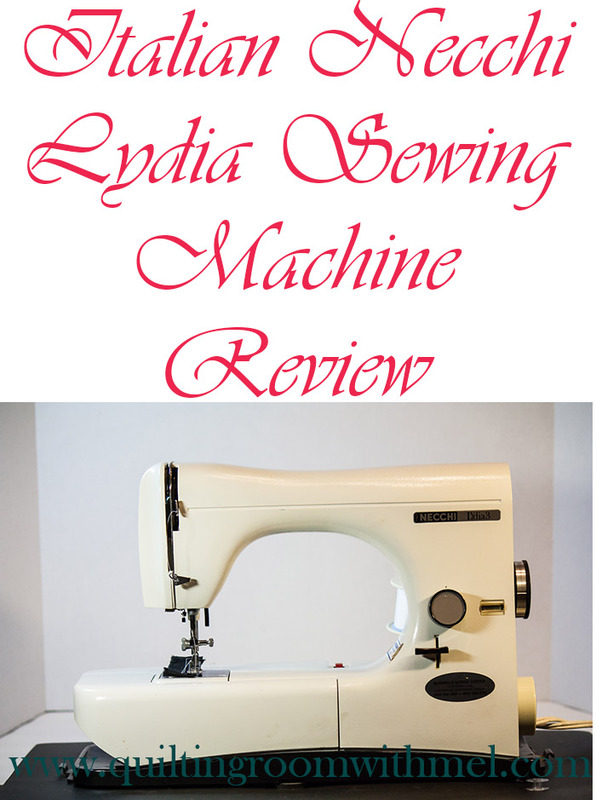 Check out my video demonstration of the machine. Want more information on the Necchi machines in my herd? Check out my Necchi Roundup page. If you want to dress up your sewing space AND get great tips delivered to your inbox be sure to subscribe to our newsletter. You'll get the cute sign you can print out as my thank you gift. Be sure to pin this graphic so you can come back if you need more information about the machine. What a steal for a machine! I bought a Kenmore when we first got married and it's still plugging along!! I still feel like I stole it! Though it did make us bring home another 30 some machines to date. So it ended up costing me a lot in the long run. lol What Kenmore do you have? I have several and just love them. This looks like a beautiful machine to own! I think it's one of the prettiest design wise that we own. Many will argue that our treadles are prettier but I just don't think they have the lines this one does. Any idea where to get an owner's manual. I am new to sewing and just got this same machine. Love her, so don't want to damage her by not knowing what i am doing. This is kind of an old thread - but I just got word that a friend of mine is looking for a home for a Necchi Lydia 3. Would you recommend this machine for a beginner? 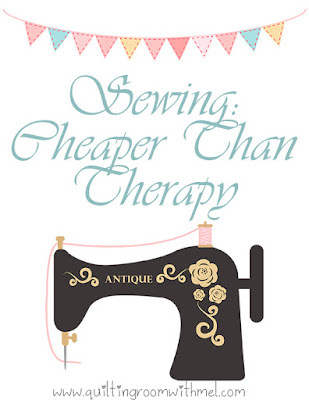 The two people that come to mind who would like sewing machines are absolute beginners. I have this exact machine with the manual. I made a copy of it and laminated it and put it by the machine for reference when I sew. Been sewing on it for probably 20 years. It came from my mother who never sewed on it so it was like new. Ive had it serviced a couple of times and had a 3d printer person make me the plastic/nylon part that holds the metal piece over the light. But went to sew on it today and cannot find the bobbin case anywhere. It seems parts are disappearing for this machine after checking on line. It's worked well for me as long as you follow the needle, thread, tension rules...thats why I keep the manual close.